ASUS has officially listed its ROG Swift PG65 Big Format Gaming Display. With BFGD, NVIDIA brings high refresh rates, G-Sync and HDR to 65-inch 4K displays. After that announcement, we knew that ASUS, Acer and HP would be among the first companies to bring out displays supporting this. The ASUS ROG Swift PG65 is a 65-inch 4K big format gaming display. This huge display comes with 120Hz refresh rate and a wide DCI-P3 color gamut. The PG65 has a 178 degree wide-view panel, so viewing angles should be good if you are sat off center. The panel comes with a high contrast ratio and 1000 cd/m2 brightness. Due to the high values, the ROG Swift PG65 is compatible with HDR images. Furthermore ASUS is marketing this display as a gaming monitor and it comes with NVIDIA G-Sync support. Like you would expect from a gaming-oriented display, the ROG Swift PG65 comes with a low latency response. Colors wise, the DCI-P3 color gamut is 25% wider than sRGB so you can expect better colors compared to a traditional gaming display. 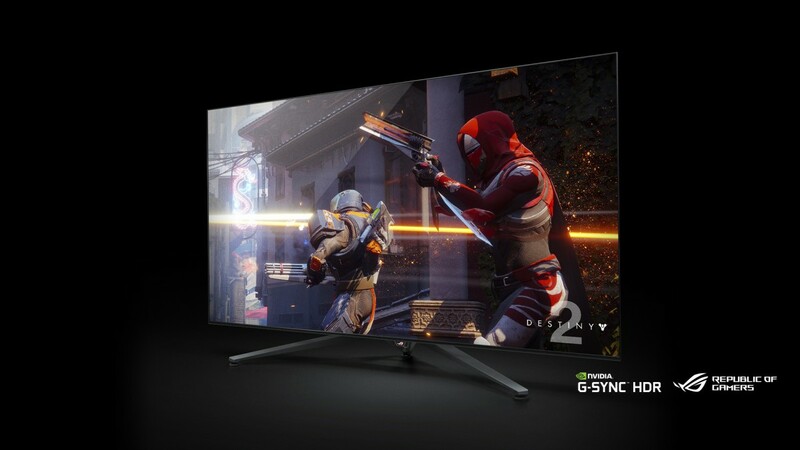 Since the smaller G-Sync HDR monitors have only just started rolling out, it is understandable that BFGDs will come later to market. So far ASUS has not revealed details on pricing however since the ROG Swift 27-inch costs €2600 Euro, the ROG Swift PG65 will likely melt your wallet.